Home | EnGold Mines Ltd.
EnGold is a Vancouver-based copper/gold exploration company focused solely on its 100% owned Lac La Hache property in the Cariboo region of BC. EnGold’s vision is to identify and delineate mineral resources at Lac La Hache that could potentially support an economically feasible and environmentally sustainable underground mining operation. The Spout Deposit, the Aurizon Gold Zone and the 2017 G1 Discovery, located within a 7 kilometer area on the property, are all considered by EnGold to be potentially underground minable targets. The Spout Copper Deposit outcrops on surface, where spectacular high-grade copper showings have attracted exploration interest for decades. The Company published a resource calculation for Spout in 2012 and aims to update this resource estimate in the near term. 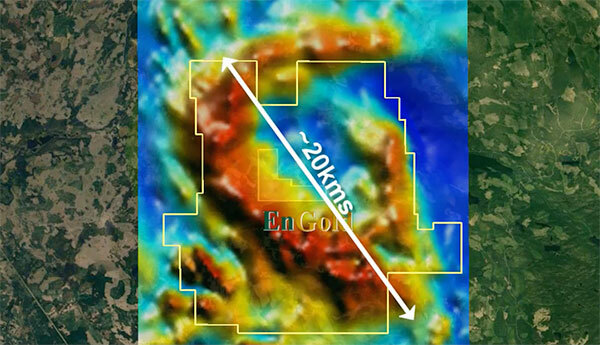 Discovered in 2017 through innovative use of gravity geophysical data and geological interpretation, the G1 Copper Zone hosts high grade copper mineralization, plus gold and silver credits, over significant widths. Discovery drill hole G16-01 intersected 1.76% copper, 0.27 grams per ton gold, 10.29 g/t silver and 35.8% iron over 26.57 meters. The Aurizon Gold Deposit host many high-grade gold, copper and silver drill intercepts over significant widths and has significant exploration potential. In early 2018, the Company published a maiden resource calculation for the deposit and filed a supporting technical report. Engold is dedicated to driving exceptional shareholder and stakeholder value by focusing on valuable and much needed metals for the global marketplace.